Billy Beane has continued to make roster moves since I last posted here. Some seem to be improvements for the team. Others are downright puzzling. Sheets Signs One-Year Deal: Undoubtedly, the biggest move is the signng of free agent Ben Sheets to a one-year $10-million deal plus incentives, to anchor the starting rotation for 2010. That makes it the largest 1-year contract the A’s have given to a free agent from outside the organization. The 31-year old hurler didn’t pitch at all in 2009 because he underwent flexor tendon surgery in his right elbow a year ago. In his 8 years in the majors, he achieved an 86-83 record with a 3.72 ERA, and had double digit wins in 7 of the last 8 seasons. In 2008 he went 13-9 with a 3.09 ERA in 31 starts. On January 19th he threw a pitching session at the University of Louisiana at Monroe, and impressed scouts from several organizations, including Oakland, reportedly hitting the low-90’s with his fastball. If he is healthy he’ll most likely be the #1 starter and will be an invaluable veteran presence for the younger guys in the rotation. 2010 Pitching Rotation: The rotation will most probably line up as follows: Sheets, Duchscherer, Anderson, Braden and Cahill, not necessarily in that order. Spring training will shake this out when we see how Sheets, Duke and Braden do, coming of long stints on the DL and surgeries last year. We can’t forget about Gio Gonzalez, Vin Mazarro, and Josh Outman who could pitch their way into the rotation, especially if one or two of the guys above don’t fare so well in Arizona. The presence of Sheets will go a long way toward reducing the pressure on the young arms that was so evident in 2009. Wuertz Returns to the A’s Bullpen. The A’s rewarded Michael Wuertz for his outstanding work in the bullpen last year with a 2-year, $5.25 million contract. The team also has a $3.5M option for 2012, with a $250K buyout if the option is not exercised. He is expected to earn $2.2M in 2010 and $2.8M in 2011. Wuertz was the A’s last arbitration-elligible player to sign. 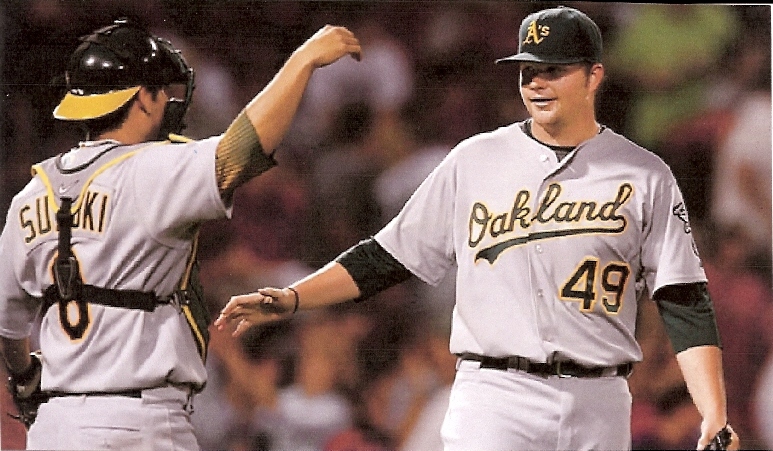 His record in 2009 (6-1, 2.63 ERA, 74 appearances, and league-leading 102 strikeouts) was so good that the A’s violated their rule to tender only 1-year deals for arbitration-elligible players. Monday, Feb 1st, Was a Busy Day. The A’s signed free-agent outfielder Gabe Gross to a 1-year contract. Gross hit .227 with 6 homers and 36 RBI’s in 282 at-bats last season for the Tampa Bay Rays. He can play all 3 outfield positions, bats left, and has always been a solid defender. “We just felt like he was a good fit for th team, whether it’s spotting some of our guys agains tough righties or filling at time since he can play both corner outfield positions. We’ve always liked the way he plays,” said Assistant GM David Forst. His signing spelled the end of the speculation that Johnny Damon might resign with the A’s. Also, last Monday, the A’s completed a trade with the Cincinnati Reds, obtaining infielder Adam Rosales and outfielder Willy Taveras for infielder Aaron Miles. It was made evident that the key player in the deal for the A’s was Rosales, as they immediately designated Taveras for assignment. Rosales completes the infield picture for the 2010 A’s, as he can play all 4 infield positions, and will be used as a utility infielder and to spell Cliff Pennington at shortstop. If any of the other infielders go down with injuries, he could get significant playing time. “Our scouts have seen a lot of him over the past few years, and every single one of them just loves the way he plays the game and really likes his versatility,” said Asst. GM David Forst, who compared his energy to that of Eric Byrnes. The A’s have until Feb. 11th to trade or release Taveras or they will be on the hook for $1.7M of his $2.3M salary for 2010. The A’s are not in need of another outfielder, especially after the signing of Gross, so they will be looking to move him in the next week. If they can’t and he clears waivers, he could go to the minors, most likely the Sacramento River Cats. Hot off the wire, Eveland was traded today (Saturday 2/6) to Toronto for cash and a player to be named later, just 5 days after he was designated for assignment. They also claimed Twins’ minor-league infielder off waivers. Tolleson, according to Forst, “…is another guy our scouts have liked since seeing him play in the Arizona Fall League in 2008. He can play a number of positions and helps add to the depth.” Both he and Rosales have options left, giving the A’s lots of flexibility, esepcially of one or two of the regular infielders go down with injury (Chavez?). Spring Training. The A’s will have a lot of depth when they arrive at spring training later this month. Is Billy Beane happy with who they have now? Not so fast. Forst said that the swarm of roster moves last Monday doesn’t necessarily mean the club is done wheeling and dealing. Miscellanea. OC Signs: Former A’s Shortstop, Orlando Cabrera signed a $3M deal with the Cincinnati Reds, which includes a $3M option for 2011 with a $1M buyout of the club doesn’t want to sign him for the additonal year. A Higher Calling: A’s Minor-League outfielder Grant Desme, the MVP of the 2009 Arizona Fall League, got a call, but it wasn’t from the A’s brass. He resigned from professional baseball in late January to embark on the 10-year path to becoming a priest, starting with studies at St. Michael’s Abbey in Orange County beginning next August. “It’s like I’m re-entering the Minor Leagues,” he said. Sacramento River Cats Owner Dies: Arthur Lynn Savage, the man who changed evenings in Sacramento and gave the River-City baseball fans a home team to brag about, passed away at his East Sacramento home on Nov. 22, 2009. He was 58. The River Cats organization is one of the nation’s most successful minor league franchises. During the last 10 years, the River Cats broke attendance records every year, outdistancing 200 other minor league teams in the country. Mr. Savage was named the Sporting News Minor League Executive of the Year in 2000 and the franchise was honored with the Bob Freitas Award for Excellence in Minor League Baseball for the 2004 season. He will be sorely missed by all who knew or played for him. That’s all for now. I’ll be at spring training with the A’s from March 17th to the 25th. It should be lots of fun watching all that talent contend for the right to break camp with the A’s. Young Pitching: The A’s young hurlers are having some successes and failures, and some of the good things don’t show up in the win column. We have to remember they are all under the age of 25, except the “veteran” Dallas Braden, who will be 26 on August 13th. These young guys are learning how to be professional ballplayers in the major leagues, not in the minors where pitchers typically spend 4 or more years before being called up. Brett Anderson had a terrific complete-game 2-hitter against the Red Sox in Fenway, which was electricfying to watch. Even the Sox fans acknowledged his feat with respect. The day before, Gio Gonzalez looked great in his 5-2 victory over Cy Young winner Cliff Lee in Cleveland. But those were the only bright spots since Dallas Braden beat Justin Verlander on July 1st in Oakland. Trevor Cahill struggled mightily in Cleveland, lasting 3.2 innings and giving up 8 runs (5 earned). In Boston, he pitched well for 5 innings, but in the 6th gave up a solo home run to J.D. Drew and a 3-run shot to David Ortiz Maybe Bob Geren needs to pull these young kids when they first get into trouble (like after Drew’s solo homer) until they get used to facing tough major league hitting. In general, I think Geren leaves pitchers in too long. Unfortunately, Vin Mazzaro pitched too well in his first 2 starts with the A’s. His luck has turned since then. It didn’t help that twice he had to face the Giant’s Tim Lincecum who is having another career season this year. He has taken the loss in his last 4 starts, although he pitched well in his last outing but got no run support. I won’t even comment on the Dana Eveland loss. I think the A’s need to cast him adrift or trade him. He has shown us over the last couple of years that he can pitch well at the Triple-A level, but falls apart in the majors. He just doesn’t fool major league hitting and I think the A’s need to wake up to that fact. I hope that Dallas Braden does well today in Tampa. We need our “veteran” Ace back. Silent Bats: Mention must be made of the A’s lack of situational hitting. A lot of the losses might have been wins if the A’s could have driven in maybe half of the runners they had in scoring position. It often seems as if the bats don’t come alive until the 8th or 9th inning when they are in the hole, sometimes a deep one. It’s too little, too late. Jason Giambi has been a real disappointment to the team, the fans and himself. No one wants to win more than the G man. Unfortunately, it looks as if he’s a little late when he swings at fastballs and doesn’t make contact. But he’s not the only one who strikes out or hits into double plays. It’s been happening all too often up and down the lineup. Matt Holliday certainly isn’t helping his chances of being traded to a contender. In short, the A’s just aren’t getting the key hits when they need them. Scott Hairston: To finish on a brighter note, the aquisition of Scott Hairston was a brilliant move by Billy Beane. We control him through 2011, and he is a terrific hitter and can handle the center field position very well. Maybe he can ignite the lineup and they can score more runs to help out the young pitching staff. Time will tell. I haven’t given up on the A’s yet. I just hope they don’t finish in the cellar. News Flash: The A’s made a move! A’S DESIGNATE ONE FULL SHARE OF PLAYOFF MONEY TO CHARITY! Contract Year is Doing Well! “Contract Year” Has Been Published! !